The Merieult House serves as the entrance to a network of buildings and courtyards that make up The Historic New Orleans Collection’s original site. During the early days of the colony in the 1720s, the block bordered by Royal, St. Louis, Bourbon, and Toulouse Streets belonged to the French Crown and was the site of workmen’s barracks and the king’s forges. 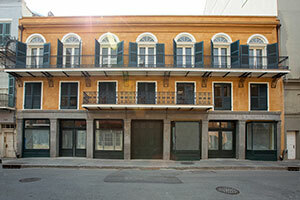 Later a private dwelling was constructed on the Royal Street lot but was reduced to rubble by the great fire of 1788. In 1792 Jean François Merieult, a prosperous merchant and trader, purchased the property and began construction on the building that would survive the fire of 1794. An inventory taken just after Merieult died in 1818 described his property as a principal house consisting on the ground floor of six stores and living quarters on the floor above, coach house, stable, cellars, pantry, two kitchens, and storehouses for wood. The Merieult House passed through five owners—ranging from international bankers to a saddle maker to a hotelier—before Kemper and Leila Williams bought it. When they lived on the property, the ground floor of the Merieult House was used commercially. Upstairs, the Merieults’ former living quarters provided room for the Williamses’ growing collection of history-related materials. Eventually, The Historic New Orleans Collection, created by the Kemper and Leila Williams Foundation, opened the Louisiana History Galleries on the second floor and located the museum shop and the Williams Gallery for changing exhibitions on the first floor. The Counting House—the two-story building on the St. Louis Street side of The Historic New Orleans Collection’s main courtyard—is named for the banking activities conducted by the Lizardi Brothers firm on this site in the 19th century. It was built, however, as a warehouse by Jean François Merieult in 1794–95. When the Lizardi Brothers firm purchased the property in the 1830s they made major changes to Merieult’s warehouse. Besides adding a second story and gallery to the building, the firm completely transformed the first floor, creating a grand Greek Revival room for banking. Today, the first floor is used for meetings, seminars, receptions, and exhibitions when additional space is needed; the second floor is used for administrative offices. Across the courtyard from the Counting House, the three-story Maisonette stretches along the Toulouse Street side of The Collection’s property line, with wooden gallery and railings defining the second and third floors. This service wing, situated on land that was part of the original Merieult purchase, was constructed over an earlier auxiliary structure that was built at the same time as the Merieult House in the 1790s. An 1819 plan of the Merieult House in the Notarial Archives shows a warehouse on this site. The Maisonette houses staff offices. Across the street from THNOC’s original location at 533 Royal Street, the new exhibition center comprises a meticulous restoration of the historic Seignouret-Brulatour Building and courtyard, as well as a brand new, purpose-built rear building. Though the original structure, built in 1816, has served many functions over the last two centuries, it is most widely remembered for four previous owners. François Seignouret built the structure as retail and residential space and adorned the balcony with ironwork bearing an “S.” Pierre Brulatour, a wine importer, purchased the building in 1870 for his retail business and residence. When philanthropist William Ratcliffe Irby acquired the property in 1918, he renovated the residence and allowed the New Orleans Arts and Crafts Club to operate on the premises from 1922 to 1933. More recently, local NBC affiliate WDSU broadcasted from the site from 1950 until 1996. THNOC will pay tribute to each of these previous occupants through exhibition installations when the building opens April 6, 2019. Surrounded by three courtyards, the Williams residence is often described as a hidden house. One side of the Williams Residence stretches along the back of the main courtyard of the Merieult House on Royal Street, but the front of the building can be glimpsed through a gate on Toulouse Street. Built in 1889, the residence is an Italianate, two-story brick townhouse with galleries. Merieult’s stables occupied the site of the Williams Residence courtyard facing Toulouse. In the mid-nineteenth century Merieult’s former home was functioning as the Royal House hotel, and the owner, Jean Baptiste Trapolin, had his private residence around the corner here. During the 1930s, the Works Progress Administration ran an art gallery in the building. Kemper and Leila Williams reunited the Trapolin house and the Merieult house by purchase in 1938 and lived in the residence at 718 Toulouse Street from 1946 until they moved to the Garden District in 1963. The furnishings and decor remain as they were in the 1940s and 1950s when the Williamses lived there. Tours of the residence are offered daily. The Townhouse is so incorporated into The Collection’s complex of connected structures that it does not appear to be a separate building. This parcel of land was part of a larger piece acquired by Merieult sometime after he had purchased the land for his house. Shortly before he died in 1818, Merieult sold this additional property to Vincent Nolte, a prominent international merchant whose memoirs were published in 1854 as Fifty Years in Both Hemispheres. The two-story brick building now on the site, dating from the late 19th century, replaced an earlier structure and was used as a banking house, according to an act of sale in 1888. Leila Williams purchased the property in 1947 and sold it in 1965. The 714 Toulouse Street townhouse was repurchased by the Kemper and Leila Williams Foundation in 1980 and today houses THNOC staff offices. The early two-story masonry house at 722 Toulouse Street provides a high wall for the adjoining front courtyard of the Williams Residence. The house that Louis Adam built here in 1788, after the first great fire destroyed an earlier structure, appears to have escaped the second fire of 1794, according to a plan dated December 25, 1794, in the Archive of the Indies in Seville. The widow of Louis Adam sold the property in 1805. That same year, the house changed hands several times and was finally bought by Joseph Guillot, who, along with his partner Claude Gurlie, was a prominent architect-builder. Guillot and Gurlie made improvements and sold the house to Jean Baptiste Soraparu in 1810 for a price indicating a substantially enlarged structure. The building gradually lost its colonial exterior over the years and was resold many times. In the 1930s, the house was opened to boarders and for a short time a young playwright—Tennessee Williams—lived high up in a garret room. When General and Mrs. Williams purchased the house in 1945, it was run-down and greatly changed. They repaired the building, but restoration to the original Spanish colonial style did not occur until the 1970s. Today, 722 Toulouse Street is used for THNOC staff offices. This double cottage, including a garçonnière at the rear of the lot, was purchased by The Collection 1990. During the summer of 1991, an archaeological dig revealed evidence of the first European-built structure on the site, a French barracks from the 1720s; a building burned in the fire of 1788; a residence from the period 1790 to 1820; and debris related to the existing cottage that was built around 1830. The philanthropist Thomy Lafon, who owned extensive real estate in the city, bought the cottage in 1876 and upon his death, willed it to the Society of the Holy Family. Constructed of brick-between-posts, the small structure—like a final mark of punctuation—is positioned at the far end of The Collection’s property on Toulouse Street. It houses the workspace of the exhibition preparation department.